Looking at the Detail of Foods: What Are We Eating and Drinking? Food is both a basic need and a valuable asset. In Germany, food manufacturers must meet high requirements in terms of safety and product quality. Read about the important contribution microscopic techniques make in quality control and R&D. Food is a basic need yet trends in nutrition are becoming ever more complex. Food is available at all times: healthy and delicious or just delicious, cheap or organic, regional or imported, “coffee to go” or to enjoy relaxing in a café. We decide daily depending on our mood or our budget. Food is increasingly becoming a tool in the search for self-realization, self-discovery, and self-image; it is a highly emotive, omnipresent issue — even for people who spend little time actually eating. Craft beer, flexitarian, vegan, superfood, “food fraud” — all of these are now buzzwords in industrialised nations. The trend is towards a more aware consumption, authenticity and sustainability of products, and towards balanced nutrition and healthy lifestyles. Furthermore, consumer curiosity is growing. And not just curiosity for new products, but also interest in their ingredients: more and more, consumers want to know what they are actually eating. To some extent, this relatively new phenomenon may also be attributable to the numerous high-profile scandals in recent years: salmonella, horse-meat, and many others. Frequently, things are found in foods that are not listed as ingredients. Or a cheaper alternative replaces a higher-quality original ingredient. There are numerous cases where substances or methods were used in food production that contravene the appropriate regulations (so-called “food fraud”). In most cases, it comes down to reducing work or cutting costs to increase profit margins. And it can often result in consumers paying the price for that. 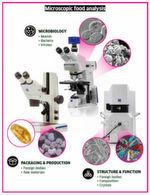 For many years, microscopy has been a key part of food analysis in quality control and R&D. Food analyses identify ingredients and additives, along with undesirable substances such as mycotoxins, heavy metals or prohibited substances. For safety and quality reasons, any foreign substances must also be detected. The microstructure of foods decisively influences the behaviour, taste, and consistency of foods. For that reason, it is important to understand processes that create various structures such as foams, emulsions, and fibres. Stereomicroscopy is used for the first identification of any unknown material. Following this, the appropriate method can be chosen for further analysis of the particle in order to establish how the foreign body was produced and in which process stage it entered the product. For more comprehensive investigations of starches, fats, plant cell walls, muscle fibres and many flavouring ingredients, it is possible to use brightfield or polarized light microscopy and fluorescence microscopy. Some food components are birefringent. Crystalline materials of this type can be imaged particularly well using polarization contrast (the photo in the gallery shows honey crystals under polarized light. It was taken using the Zeiss Axio Imager.Z1 light microscope). To provide evidence of microorganisms such as bacteria, images from stained samples taken using fluorescence microscopy are essential. As most foods contain large quantities of water and/or fat, major benefits are achieved from using scanning electron microscopes, which allow control of pressure and humidity in the sample chamber. Page 1: Looking at the Detail of Foods: What Are We Eating and Drinking?